Dress Style III(picture here) is described as “a garment with a vertical front opening clasped by two brooches, one at the throat the other centre-chest, and worn with a buckled belt.” For ease of reference I’m referring to this at “the tunic”. ‘Button loops’ from Buckland Dover, Parfitt, p. 201. In researching the tunic layer I’ve come across a couple of references to some truly spiffy button loops used to hold the button brooches on either side of the front opening (at the collar and bust level). 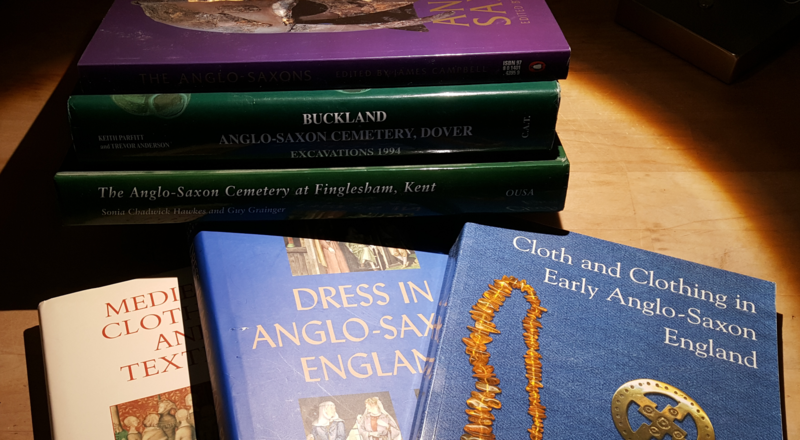 I have found three sources which mention the Kentish Anglo-Saxon button loops. One source (Saltwood) mentions that the loops are specifically not present at the dig. With the other two sources (listed below) I was super pleased that the two sources are by different authors and they agree as to the interpretation of the finds. Then as I read Source B in finite detail it occured to me that it is very close in tone to Source A… so I dig deeper… it turns out Source B was EDITED by different people.. but the section I’m currently looking into has the same author as Source A. *grumble* So much for corroborating evidence. So it turns out that all sources which mention the button loops are written by Penelope Walton Rogers. Ah well, it’s the best evidence I’ve found so far. “At Dover Buckland II K7, fine linen ‘button loops’ had been worked on a front-opening garment in nine women’s graves (Fig 3.32e). 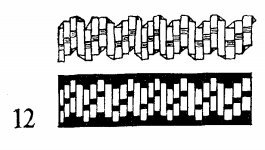 These were made by binding a bundle of threads in button-hole stitch, the ends of the loops being attached to the garment edge.” (Rogers, p. 100). made with S-ply yarn binding bundles of 20-30 fine Z-spun yarns, (except for one grave). Parfitt mentions that only on one grave do the button loop threads appear on the lower button brooch. Parfitt further mentions that most examples are preserved at the hinge end of the pin, but that there is evidence hinting at the presence of a loop at the other end..
Saltwood specifically mentioned it did NOT have button loops but did have other strings that may have been used in lieu of the button loops. I’m making the assumption that the front edges of the opening of the linen tunic have been finished in some way. I’m at a tossup as to whether I’ll finish the edge with a rolled hem or by adding a facing to the inside of the garment. Neither source which mentions button loops says how far apart the top and bottom of the button loop are when they’re attached to the garment. Parfitt does show two 1:1 redrawings of button brooches with loops attached to the back. The loop ends appear to be about 1/4″-1/2″ apart. Neither source mentions how long the button loops are end-to-end. I’m going to make them fairly short. Just long enough to allow for the button pin but not so long that they create a lot of gap-osis on the front of the garment. Neither source specifically mentions the size of the linen thread. Rogers does refer to the loops as made of “fine linen” but it’s unclear whether this is describing the small size of the completed button loop or the gauge of the linen thread. Parfitt mentions that there are 20 stitches per centimeter. I may be able to use that to figure out my gauge. I plan to use some 60/2 linen thread which I purchased from Wooded Hamlet Designs several years ago. This is a very fine sewing thread made of Z spun yarns which are S plied. For the loop portion I will make 20-30 passes of the thread. Then I’ll use the same thread to do the button-hole stitch over the loop threads. Placement of the two button brooches. Both sources say that the brooches are found at the neck and at (what I assume is) the apex of the bust. Specific measurements between the brooches is not given. From personal experimentation I can say that 3.5″ is about where I expect to place the button loops for the least amount of gaposis on myself. Parfitt, Keith and Anderson Trevor, eds. Buckland Anglo-Saxon Cemetery, Dover: Excavations 1994. (The Archaeology of Canterbury, n.s. 4.) Canterbury, UK: Canterbury Archaeological Trust, 2012. Print. Note that the “Part 5: Costume and Textiles” portion of the above source was written by Penelope Walton Rogers. Walton Rogers, Penelope. Cloth And Clothing in Early Anglo-Saxon England, AD 450-700. York: Council for British Archaeology, 2007. Print. Walton Rogers, P. “Early Anglo-Saxon costume and textiles from Saltwood Tunnel, Kent”. Channel Tunnel Rail Link London and Continental Railways Oxford Wessex Archaeology Joint Venture. CTRL Specialist Report Series. 2006. PDF.